Exclusively from our world renewed Estate collection, come a high polished and classic pair of earrings from David Webb. David Webb is the quintessential American jeweler of exceedingly modern jewelry. Driven by art, design and bold pieces these earrings embody David Webb’s textured gold statements. 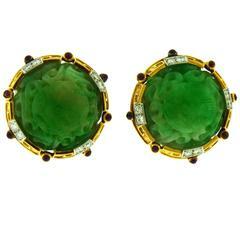 The earrings are 18K yellow gold and platinum with a ribbed detail set with 24 round brilliant 0.75ctw (G color and VS clarity) diamonds. 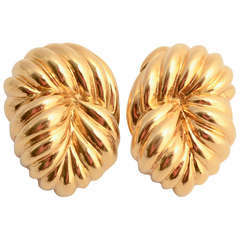 These dome shaped round studs are truly meant to be worn with confidence and grace. Button style earrings by David Webb. They are crafted in 18K hammered yellow gold. Clips. Measure 1" wide and stand 9/16" off the ear.